Two years after fashion designer, Ralph Lauren shuttered Ralph’s Coffee, a café named after his namesake, it reopened in the fall of 2018 for a month of coffee to celebrate Ralph Lauren’s 50th year in fashion. Then followed a pop-up at its women’s flagship store and a soon to open in the spring, a permanent Ralph’s Coffee. All iterations perhaps prove that Ralph’s was never meant to shutter in the first place. 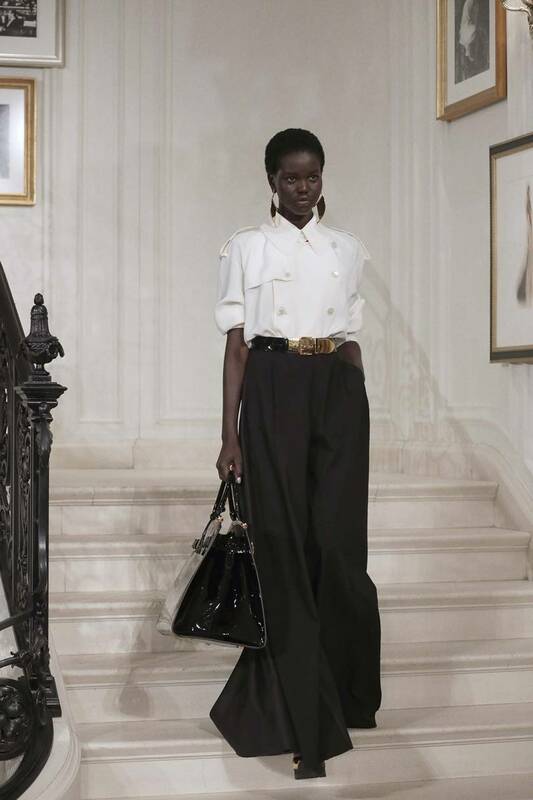 And now, the café – inspired by the iconic cafes of Paris – serving java, mocha and treats takes on New York Fashion Week Spring/Summer 2019 where the Madison Avenue women’s flagship hosted his collection. Models walked down spiral steps in colorways of white, black, cream and gold to a café setting where well-placed mirrors, minimalistic tiled floor and honeysuckle curtains played to the visuals of its guests. The music played too: Feierlich Und Gemessen’s ‘Ohme Zu Schleppen’, Einz Swei Polozeo’s ‘Mo-Do’ and Karen Souza’s ‘Paris.’ Sitting at circular marble tables, with hosts delivering coffee and accompanying treats, the collection found an audience under chandeliers and among the fashion curious. Florals and gold, slick ponytails and corn rows all added to create a sense of vintage elegance, effortless yet detailed. The forty-one looks “celebrates a pure and powerful kind of luxury with punctuations of high contrast and sleek shine,” said Lauren via his website. There was all the charm and coffee to behold. This entry was posted in new york and tagged coffee, new york, ralph lauren, spring, summer. Bookmark the permalink.